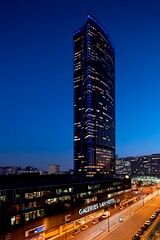 Paris, France - The first night of spring 2012 marked a new page in the history of the Montparnasse Tower. Yesterday evening, Wednesday 21 March at 19: 30, the new lighting design of the Tower was inaugurated. Almost 40 years after its construction, the Montparnasse Tower will be lit up every night, using different lighting scenarios which will change with the seasons. Thanks to this new lighting, the tower becomes a major visual landmark of the Parisian night sky. On behalf of the co-owners of the Tour Maine Montparnasse, the lighting designer, Régis Clouzet, imagined a sustainable and evolutionary lighting in partnership with Philips Lighting. “With this subtle lighting design, carried out with our partner Vinci Energies Citéos, Philips contributes a new signature to the urban night landscape of Paris”, says Benjamin Azoulay, CEO Philips Lighting France. Philips was chosen for its expertise in creating real luminous pictures of light. “Paris, city of light, would equip its highest building with an innovative and sustainable lighting solution” continues Benjamin Azoulay. A vision of proximity: the implemented solution consists exclusively of Philips’ iColor Accent solution. Fixtures are installed inside the building. To avoid any discomfort to the occupants, they have been integrated in a visually aesthetic box. In the daytime, the luminaires are visible neither from the inside, nor from the outside. A distant vision: 58 iColor Reach projectors have been installed on the top floor.The new lighting is thus visible throughout the Parisian region, visible to its 12 million inhabitants. The results go beyond the objectives set by Régis Clouzet, since the complete “outline” of the tower is visible from more than 8 km. A fifth light scenario, named “festive”, will give rhythm to the various Parisian events with which the Tower will be associated: the White Night (La Nuit Blanche), the Music Festival (La Fete de la Musique), at which time artists (videographers, painters...) will be able to use this light device, symbol of modernity, creativity and movement to renew the Tower lighting according to the occasion. The Montparnasse Tower, which continues its commitment to the environment, made the choice to limit electricity consumption by using new generation light-emitting diodes (LED). To enhance this effort, the Montparnasse Tower has opted for an alignment of the light installation during the time slots where the use of power is at its the lowest, with the possibility to turn off the installation at any time. The implemented solution also presents a luminance that is 3 times lower than the original lighting solution, reducing the light pollution. All in all, the energy consumption of this new lighting is reduced by more than 90% compared to the previous installation, going from 272 kWh to less than 25 kWh. Energy used for all of the 56 floors of this tower that is 210 metres in height is the equivalent to the power used in 10 irons! The cost of maintenance of the tower is almost zero: LED technology minimizes changes in lamps, since the products used have a lifetime of 50,000 hours. 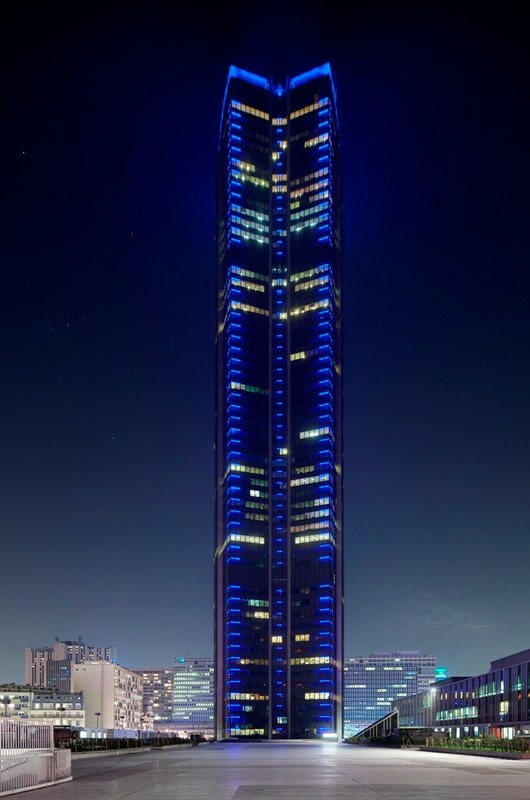 The installed illuminating structure is composed of 972 Philips dynamic LED battens and 58 LED spotlights on all floors, with the latter ensuringvisibility from a distance. Each batten is composed of 40 light pixels. Each of the scenarios is a harmonious arbitration of the present 40,000 pixels. The selected ighting technology allows light to work point by point, "to the pixel", as it is in video. Each "RGB" pixel is one of the three primary colours of light (red, green, blue); their association thus provides an infinite palette of shades from white to frank colours. To coordinate each scenario, very powerful computer tools have been utilized. An optical fiber Ethernet network was deployed throughout the tower for interacting on each pixel instantly and at the same time. A control system connected to a very high speed network (Gigabit/s) allows the coordination with a video System Manager. The latter allows the mapping of the installation and use of a single media server with a DVI input (Media Server provided by Axente, a Philips partner). The installed Ethernet network was designed to support new extensions; the tower lighting and its control are open in the future to new developments which can be easily implemented. Citéos, of Vinci Energies Group, a Philips partner company, completed the installation of light fixtures. The installation of this new lighting has taken 8 months of night work, between August 2011 and February 2012. 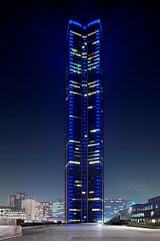 Energy used for all of the 56 floors of this tower of 210 metres high will be the equivalent of 10 irons! 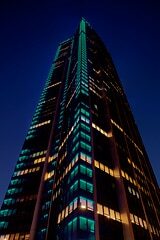 Extremely low consumption: less than 25 kWh, namely 0,3% of the consumption of the offices lighting of the Montparnasse Tower (against 4% currently) and 0,2% of the global power of the tower. 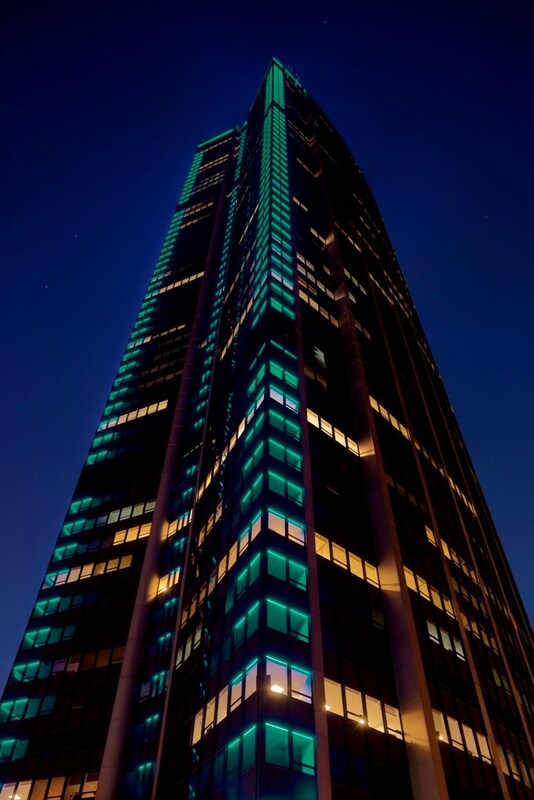 The co-owners of the Montparnasse Tower chose the creativity and expertise of the lighting designer Régis Clouzet to imagine the new lighting. Since 1992, he has been working on urban and architectural lighting design. He is the manager of Agence Lumière, an independent design agency and relies on a 20 years professional experience in the field of architectural lighting. He covers major urban projects such as the Fort St Jean in Marseille, two stadiums in Algiers and Oran and original projects in Rio de Janeiro and São Paulo.